The Moon Phases in order with official names. The Moon Hat is a science gift for the curious. Precisely placed Moon phases “point” to the Moon in the sky and help you find it day or night. Buy a Moon Hat (a great science gift made by Star In A Star – order today and get FREE shipping), you can learn all about the Moon phases every time you wear the hat. The Moon Hat is a scientific “moon-finder” instrument that helps you locate the Moon in the sky day or night. 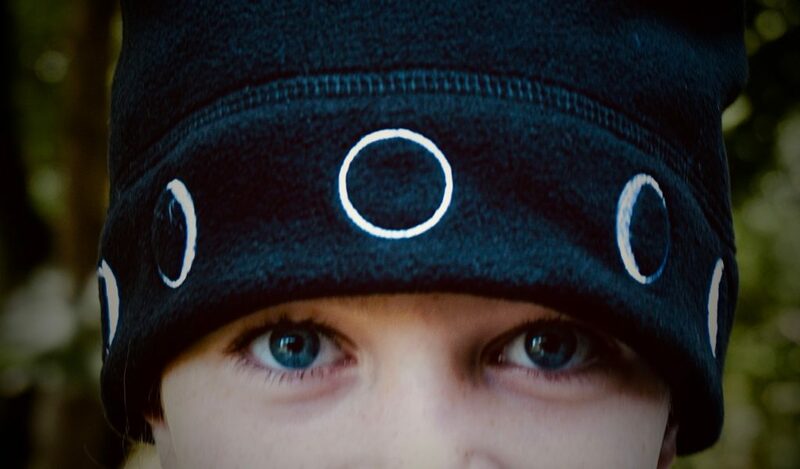 The Moon Hat is one in a line of “Science Clothing – clothing that makes you smarter!” It was invented and is made and sold by Daniel Cummings – the owner of this website and the author of this blog. New -> WAXING aka GROWING -> Full -> WANING aka SHRINKING -> New. Studying for a Moon Phases quiz? Just remember that sequence of letters: NCQGF. That gives you the order of the waxing phases, then reverse it to get the waning phases: FGQCN. The good thing about this sequence of letters is that you just have to memorize it one way! During your Moon Phases quiz you can write it down and then reverse it. The Moon Phases happen in a cycle that repeats. Here’s a good way to remember the order of the Moon phases if you have to give the phase name based on an image of the phase: DOC. 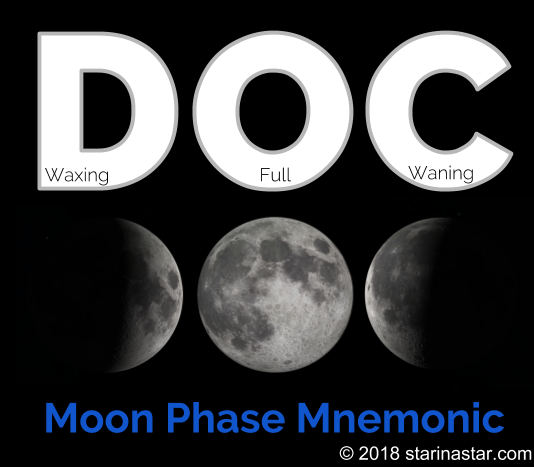 The three letter word DOC is a good mnemonic for remembering the Moon phases names and how they grow first and then shrink. It’s a “shape-ronym” – I have a feeling I just invented that name – it’s where the letter shapes help you remember something. If the Moon phase is shaped like the letter D that means it is growing (waxing). If the Moon phase is shaped like the letter C that means it is shrinking (waning). If it’s shaped like the letter O – it is full: in between waxing (D) and waning (C). NOTE: if you are in the southern hemisphere the mnemonic is COD because the Moon is Upside Down. As soon as the growing (waxing) Moon becomes a Waxing Crescent Moon we can see that the shape of the lit up part of the crescent can make the capital letter D. As the Moon grows through to Waxing Gibbous phase it is still shaped like a capital D.
The Full Moon is shaped like a capital O. The waning phases make the shape like a capital C.
Here are a some interesting patterns in the Moon phases names. The cycles repeat – New to Full to New (again). The Moon grows (waxes) and then shrinks (wanes) again. Why doesn’t the Moon grow to a Full Moon and then just blink out and start again… or maybe it could stay the same shape all the time… so many possibilities… why does it grow and then shrink? The New Moon is the commonly accepted “beginning” and also the “end” of the cycle. There is a first and third quarter, but no 0th or 4th quarter. Wax and Wane are more weird, old words – they are words originally handed down from the ancient language Sanskrit that made their way through history to old German and finally to old English. What’s the deal with First Quarter and Third Quarter? The Second Quarter would be the Full Moon but we don’t use that name. But, then what would the New Moon be called? Is it the Zeroth (0th) quarter or the Fourth (4th) Quarter? Is the New Moon the beginning or the end of the orbit? Based on the more common name it should be called the zeroth quarter because it is the “New” part of the orbital cycle. Zero = nothing and during the New Moon there is no Moon visible. The Moon is at “First Quarter” but its shape is half a moon! This is kind of strange too: the moon looks like a “half moon” two times during the moon’s cycle. It is a half moon as it grows (waxes) and becomes a half moon again when it shrinks (wanes). The moon is clearly showing half a moon. Regular people call it a “half moon” even though astronomers call it a quarter moon. We should all call the first quarter moon the “waxing half moon” and the third quarter moon the “waning half moon.” But, these are not common names at all! Actually, I’d like to call the first quarter (waxing half moon) the “Earth’s tail moon” and the third quarter (waning half moon) the “Earth’s nose moon.” These names point out a neat fact about the Moon’s orbit – it crosses the Earth’s orbit twice a month – once at first quarter, then again at third quarter. Anyway, why do astronomers call a half moon the quarter moon? How to remember the phases of the moon? 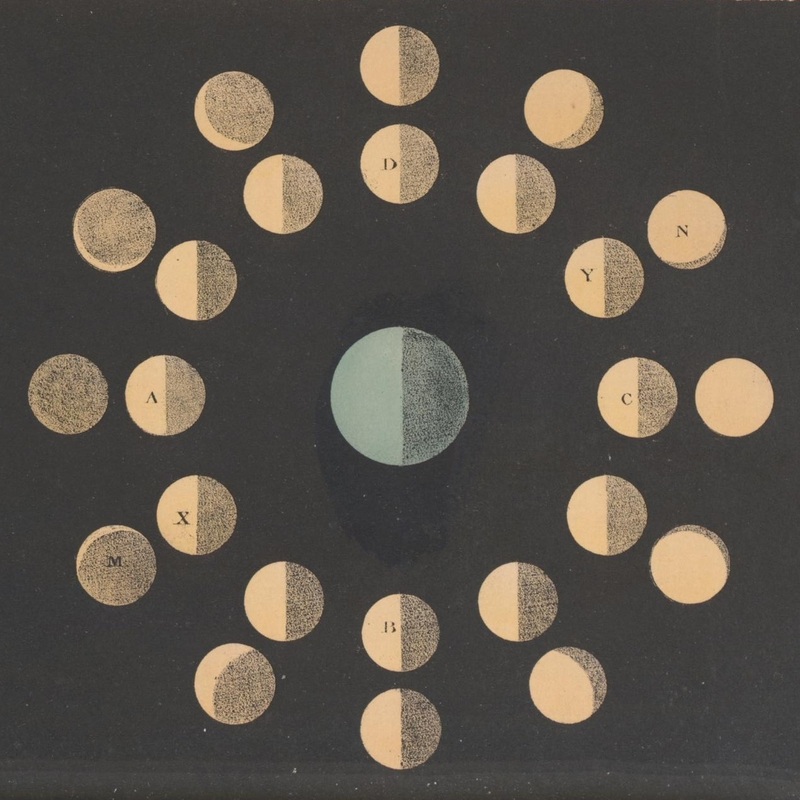 Let’s face it, the Moon phases are named with really old words – the kind of words we don’t really use anymore, but we are stuck with them because the Moon is kind of important and we can’t just ignore it. These word describe the “Shape” of the Moon: half moon, full moon, gibbous moon and crescent moon. This word describes the Orbit of the Moon: quarter moon. Each day, the Moon moves along an orbit that carries it around the Earth. It takes about 29.5 days for the Moon to make a complete trip from one New Moon to the next New Moon. Each day the Moon moves about 1/27th of the sky: 360˚/27.5 days = 13.1˚ per day. This is about the distance between your index finger and your pinky held up at to the sky at arms length. The Moon moves eastward each day toward the dawn. The Sun is always lighting up half of the Moon. The light of the Sun always comes from one place – the Sun! Light from the Sun hits the Moon and lights up half of the Moon at all times. However, it is not always the same half that we are looking at from Earth. The Moon shows us only part of its bright side for most of its 29.5 day orbit. It’s only during the Full Moon that we see the entire “half” illuminated Moon. The Moon changes phase because the Moon moves. As it moves, we see different light from the Sun reflecting off the Moon every second. The amount of light we can see changes every second as it moves through space around the Earth. A fun and easy thing to watch with a telescope is to look at the Moon and see the Sun’s light casting changing shadows on the Moon. This article summarized the names of the phases of the Moon and pointed out some interesting patterns. You learned a mnemonic (shape-ronym) device to help remember the order of the Moon phases. A recent visitor told me about this fun video: Mr. Lee Phases of the Moon Rap.